Signed l.r., black paint "F.B.". Not dated. 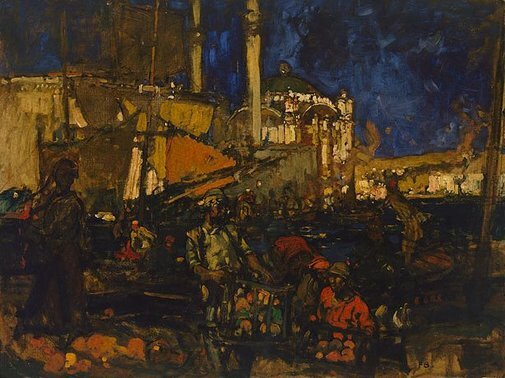 Frank Brangwyn 1867–1956 , Leeds, 2006, p 65. Art Gallery of New South Wales catalogue of British paintings , Sydney, 1987, p 17, illus p 17. British painting 1800–1990 in Australian and New Zealand public collections , Sydney, 1997, p 54, no 197. The exhibition of the Royal Academy of Arts … the one hundred and thirtieth , London, 1898, p 13, no 218. The Royal Academy of Arts: a complete dictionary of contributors and their work from its foundation in 1769 to 1904 , London, 1905-1906, vol 1, 1905, p 270. Catalogue of acquisitions 1976 , Sydney, 1978, p 81, no 250. Art Gallery of New South Wales annual report for the year ended 30th June 1986 , Sydney, 1986, p 28. Loan.